If you have ever been an overworked, underappreciated retail employee, this story will make you happy. 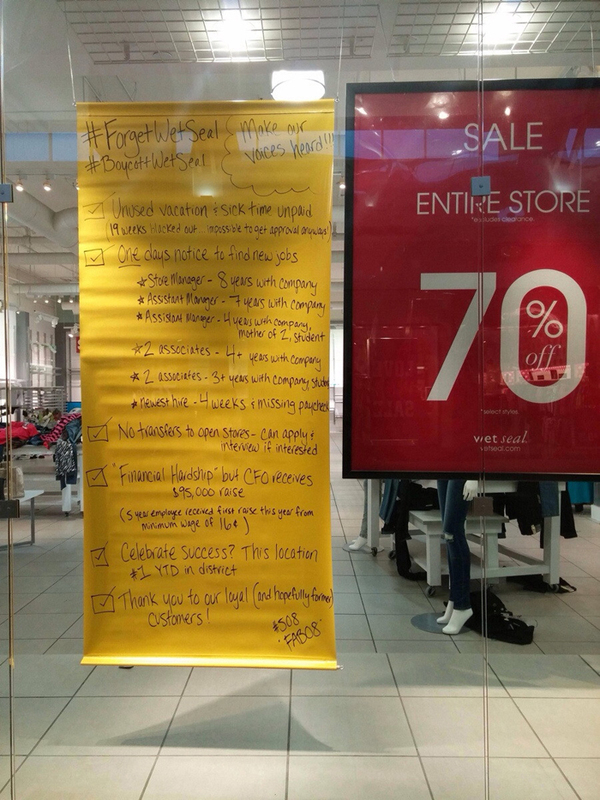 Some pissed off workers at the Wet Seal store at the Northgate Mall in Seattle posted this sign yesterday in their storefront. The huge yellow banner outlines all of the mistreatment the store’s employees have endured since they started working there. Among the highlights: refusal to pay for unused vacation days that were nearly impossible to take due to blackout dates; the one-day notice firings of long-time employees; the lack of transfer opportunities with other Wet Seal locations; 16 cent raises for five-year employees; $95,000 raises for the CFO; and much more. Read the whole thing for yourself. Hopefully this helps the less fortunate employees who are suffering from these horrible policies. The hashtag has already started popping up on Twitter and, depending on the swell of support online, it’s only a matter of time before the company responds.